TheTownCrier: Betrayed by the Senate and White House again! Photo: Mexicans line up at the U.S. Consulate in Monterry, Mexico, to apply for work visas. That's right kiddies!! 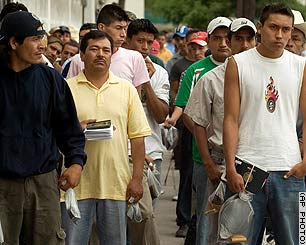 The Amnesty is for the 12 to 20 million illegal aliens ALREADY here! The ones lining up are for the millions more visas they will give out to ones not here! Better learn your spanish and learn to accept Muslim law! You've just become the minority with NO representation! A new bill would grant quick legal status to millions of illegal immigrants already in the United States and fortify the border against new ones. The measure was announced Thursday by a bipartisan group of senators who reached an agreement with the White House. "It is not amnesty. This will restore the rule of law," said Sen. Arlen Specter.